As I wrote last week, I really believe that the Leafs missed a bit of an opportunity at the 2016 NHL draft. It looked as though the team may not have utilized sound asset management when reaching for a couple of picks – and drafting guys that have next to no chance at the NHL like Keaton Middleton. That said, over the past three years, the Maple Leafs have built a prospect pool that is light years ahead of anyone else in the NHL – Just ask @thejustinfisher. In actuality, with the addition of Clayton Keller and Jakob Chychrun to an already great prospect pool, the Arizona Coyotes probably have the best group of young talent. The Leafs prospects are definitely top-5 and likely in the best two or three in the NHL. With that, let’s take a look at the Maple Leafs prospect depth chart. When you look at this forward group, there is a lot to get excited about. Three blue-chip prospects to build around and a plethora of secondary guys to be the compliments down the road. it’s foolish to think a large percentage of your prospects will turn into impact NHLers but if even just 1/4 of Kapanen, Lindberg, Brown, Brooks, Grundstrom, Koshkov, Bracco, Hyman, Timashov, Leipsic, Soshnikov, and Rychel pan out, that’s three impact players to go along with the star potential in Matthews, Marner and Nylander. Despite the team’s best two prospects currently lining up down the middle, the center position is one that is very thin for the organization. I suppose the hope is that with Kadri around long term, he Matthews and Nylander are all the team will need for a long while. This group of defenders is far less inspiring than the forwards. The hope is that Zaitsev can jump right in this season and provide a right-handed shot to help the Leafs top-6 right away. 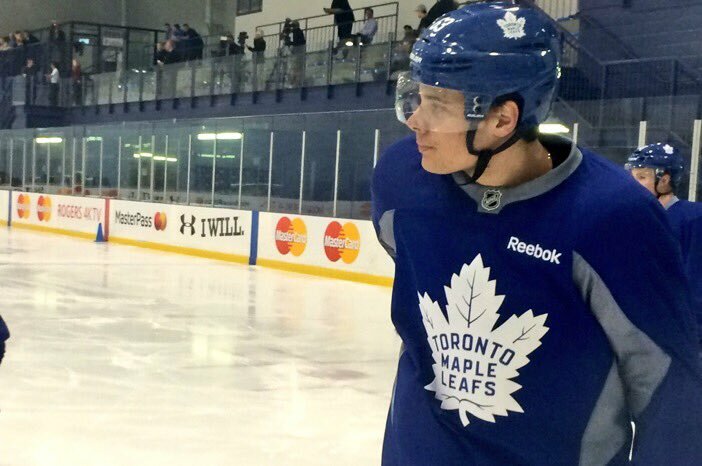 Connor Carrick is another that the team likely hopes will be a big part of the 2016-17 Maple Leafs. Beyond that, there are nothing but a lot of question marks. Travis Dermott was one of the best defenders in the OHL last season but doesn’t necessarily play a game that is conducive to being impactful at the NHL. It will be very interesting to watch his development with the Marlies as the team hopes he can turn into a second pair NHL defenseman. Andrew Nielsen took a huge jump last season but still needs to become a significantly better skater to be a regular in the NHL. Jesper Lindgren is a guy who many think might have some potential down the road but until he plays a game in North America we should probably count him as long shot at best. Greenway and Mattinen are two defenders out of this year’s draft that have very intriguing potential. Both are projects and a long way from the NHL, but I wouldn’t be surprised for either of them to outperform their draft spot as they develop. **Walker is a guy that can play both forward and defense. The Leafs have him listed as defense on their site, so for the sake of this exercise, that’s where we have him. In my eyes, Joseph Woll is the only true prospect in the Leafs organization. Sparks, Bibeau and Kaskisuo are all decent depth goalies that project to be long-term AHLers. If one of those three has to ever play more than a handful of games at the NHL level, the organization is in some trouble. Woll on the other hand, is a very intriguing youngster that has a ton of potential. He’s still only 17 so he has a long way to go. Woll was a little under the radar going into the draft as he was largely outplayed by his teammate Jake Oettinger all season. That’s nothing to be concerned about as Oettinger is expected to be the top goalie prospect drafted in the 2017 draft. Heading to one of the best NCAA programs, Woll is expected to start for Boston College next season as a freshman and begin his development into a pro-level goaltender. He’s a big athletic and the organization has a prospect that is so raw that they can mold to their will. Woll’s development will end up being a yardstick for the organization’s work with goalies. He will be the true test of how well the Maple Leafs as a franchise can develop a goaltender from the ground up. Nice Article – Good reference for future. Curious about Lindberg are you higher on him than Brown, Grundstrom, Bracco, Hyman? I think Lindberg has the potential to be a second line winger at the NHL level while I think Brown, Grundstrom, and Hyman are bottom-6 guys.